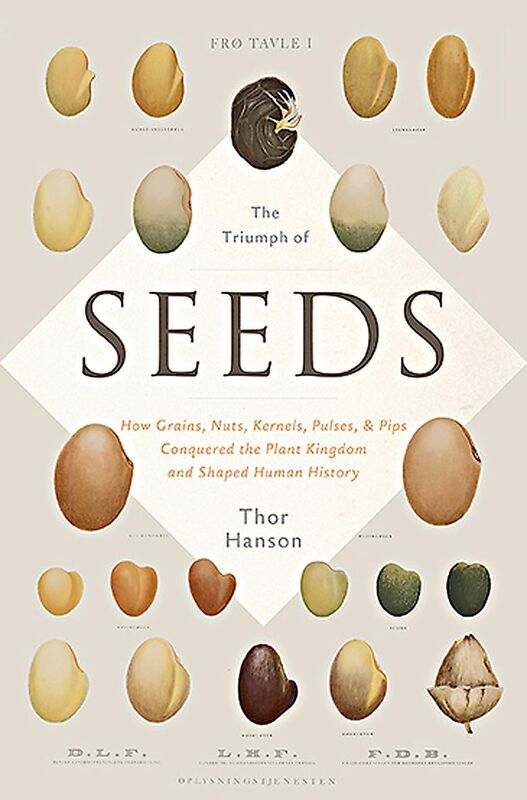 In “The Triumph of Seeds,” San Juan Island conservation biologist Thor Hanson explores the many attributes of seeds, from their role in prehistory to their role as nutrition for many forms of life. Hanson discusses his book at several Seattle-area locations in April. In 2011, when San Juan Island conservation biologist Thor Hanson published “Feathers: The Evolution of a Natural Miracle,” he explained that the book’s inspiration occurred when he was jogging. Several turkey vultures flew off at his approach. One dropped a flight feather, which landed at Hanson’s feet. He had been pondering what to write about to follow his first book on gorillas in Uganda. Now, the vulture’s feather, it seemed, had almost hit him over the head with a worthy topic. His luck for finding then writing about the magic in something common continues with “The Triumph of Seeds” (Basic Books, 277 pp., $26.99). This time, he explains, his son, Noah, who “was obsessed with seeds,” provided the idea. Neither Hanson nor his wife could explain this unlikely passion. But the fact that as a doctoral student, Hanson had studied seed dispersal and seed predation in huge tropical rain-forest trees meant Noah’s infatuation played into a subject already dear to Hanson’s heart. • 7 p.m. Thursday, April 9, at Third Place Books, 17171 Bothell Way N.E., Lake Forest Park; free (206-366-3333 or thirdplacebooks.com ). • 7:30 p.m. Friday, April 10, at Town Hall, 1119 Eighth Ave., Seattle. Tickets are $5 at 888-377-4510, townhallseattle.org and at the door beginning at 6:30 p.m.
• 7 p.m. Saturday, April 11, at Village Books, Bellingham (360-671-2626 or villagebooks.com). This climatic shift, which most spore plants couldn’t adapt to, was believed to have allowed seed plants to dominate. But bogs, he notes, preserved ancient life-forms well while dry habitats didn’t. The preponderance of fossilized spore plants dating to the swampy Carboniferous, it’s now realized, caused “preservation bias,” meaning accepted theories might be skewed. More probably, spore and seed plants coexisted, but seed plants mostly grew in places where they were rarely preserved. Seeds with coverings allowed plants to depend more on animals and less on wind or water dispersal of spores for reproduction. In turn, seeds prompted growing diversity in pollinators and life on Earth. Homo sapiens, which depends on harvesting crops from seeds, might never have moved on from hunting and gathering without them. After grasses and seed evolution, Hanson considers dormancy; visits a seed bank; discusses seed self-defense (hotness, bitterness, poisons, hard shells); sketches spices’ effects on world trade; and examines coffee’s caffeine, a natural fungicide and herbicide. He continues with pharmaceutical uses. Fruits’ colors, tastes and aromas lure us to disperse seeds; other strategies include hooks, spines or stickiness. Velcro was invented by a man whose dog was troubled by burdock seeds. Some seeds disperse on plumes; others glide on wings, a shape the stealth bomber echoes.